Since I sold my Ossie Clark for Radley maxi dress about three years ago-something I did regret, but as they say 'c'est la vie', I've been after a vintage original maxi and have never been able to find the perfect one-until now. 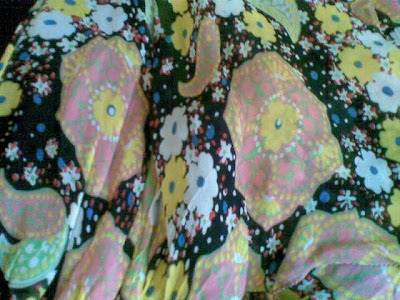 Scouring Ebay, I found this gorgeous black maxi floral dress by 70s designer John Bates, aka Jean Varon. What item are you hankering after this Summer season? Oooh, it looks so divine! Sharon you look super slick and feminine!!! I own a Jean Varon snake and leather purse that I thrifted about 10 years ago for less than $5.00!!!! Beautiful dress! 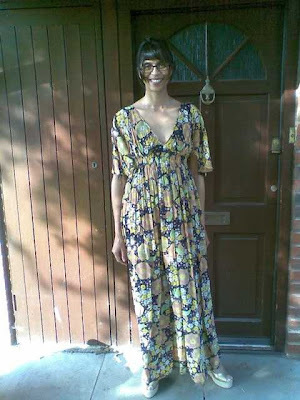 I'm all about the maxi length this season and this one is definitely channeling Ossie Clark. 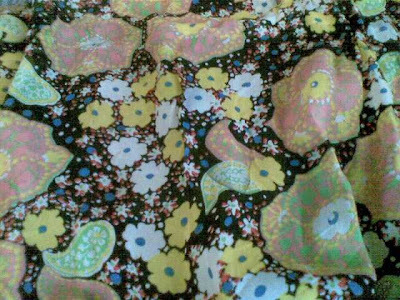 You can't really go wrong with a floral print either! Love it! I too am embracing floral maxis as it get warmer. I must get mysel one, soon. Definitely floral dresses. Your dress is beautiful! One of my favourite outfits of yours - it gorgeous and looks lovely on you. Really suits you. This is very beautiful and looks just stunning on you, what a find! I'm still looking for my perfect trouser, what they are I just cannot decide! It's completely gorgeous! I love the draping and the shape of the upper body. By the way, I can appreciate that the mink stole in my set isn't your thing. I just want to reassure you that I've been a staunch vegetarian for 14 years now and I only own the stole because it's very old (1930s) and so it's difficult for me to resist a piece that's SO antique and can be bought from a vintage store so none of the cash goes back into the fur industry. Oh Sharon! It's fabulous! You look wonderful in it. You need a backdrop of the South of France or somewhere to set it off perfectly. What a brilliant find. What a lovely pattern, color & style. It looks as if it were made JUST for you! Oh you look a million bucks Sharon! It was made for you. I'm off to ebay uk in search of one for myself now! You look gorgeous Sharon! I love that dress and I think it's perfect for the lovely weather, you just need a wide brimmed hat! Lovely! Lovely print. I can see you wearing this a lot in summer. My dear you look so lovely as per usual!!!! Hope you're having a nice time. Here the weather is so terrible!!!! OMG I am *dying* over that dress! That is just sooooo right on! I have almost an obsession with maxi dresses lol! I've already bought 3 of them and have 2 more on a shopping wishlist. But I think they did maxi dresses best in the '70s. 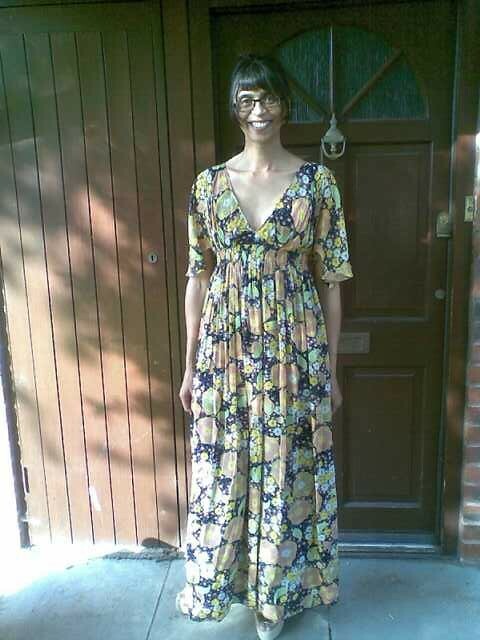 I wonder whether it's because, growing up, I'd see my aunts wearing maxi dresses and skirts and the image just stuck in my brain because I thought they looked so beautiful. I'm going to try and wear one of the maxi dresses I bought for my baby shower next week, and I'll post pics! Hopefully it will look okay. I'll be able to wear them after the baby too, so I'm really happy about that. That dress is perfect for you. You look lovely. this dress is so stunning, a real 70's dream! what a great find and such an iconic piece! love the colours! Oh how amazing! I love the pattern on that dress, what a wonderful score. You look fabulous, wish I could see the shoes more.